Users are persons with online access to your XLReporting account. Each user has his or her own login and personal dashboard(s). Click on the Actions - Create new button of an existing user. This also enables you to make a copy of an existing user. The user's email is also their login for XLReporting. 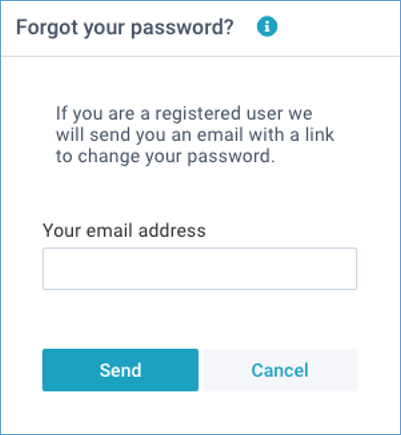 User activation, password reset, and system notifications all require the user to have a valid email address. This page also shows all recent activity of this user. Email - enter a valid and unique email address. The email is also the user's login for XLReporting. Name - enter the person's name. This name must be unique within all your users. Active/locked - activate or lock a user. When locked, the user can not login. Group - select how this user is to be shown in the menu navigation. User roles - assign one or multiple user roles to this user. This determines the permissions of this user. Mobile phone - enter the user's mobile phone number, including country prefix. This is used for Two-Factor Authentication. Enable API - enable API access for this user and obtain an API token. You can retrieve data from -and import data into- data sets through the XLReporting API. For example, you can send data directly from another system or database into XLReporting without having to go through the web pages. Or you could retrieve data from XLReporting directly into another system or into an Excel workbook. API tokens are valid for 360 days, and they can be revoked or renewed at any point in time. When you create a new user, XLReporting will send that person an email with an invite link. Users can click on that link to activate their login and enter their initial password. If a user has not received this email (or it has gone astray in his or her inbox), you can resend that email by clicking on Actions - Send email invite. XLReporting will send that person an email with a temporary reset link, where the user can enter a new password. You can also send a user the same email by clicking on Actions - Send password reset.